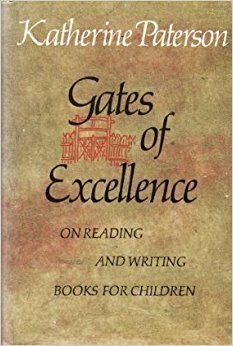 Gates of Excellence: On Reading and Writing Books for Children is a 1981 collection of essays by Newbery author Katherine Paterson in which she reflects upon her work as a children's writer and the reading of children's literature in general. Included in the collection are book reviews and articles Paterson wrote for various publications, as well as newly written pieces for this book and excerpts from her Newbery and National Book Award acceptance speeches. What struck me about this book as compared with something like Mabel Robinson's Writing for Young People, is that this is decidedly not an instruction manual for becoming a writer. Whereas Robinson and other authors (Gail Carson Levine, for example) use their books on writing to advise aspiring authors, Paterson instead relates her personal experiences, good and bad, and shows how reading and writing children's books has shaped her life. I follow Ms. Paterson's Facebook page and I saw her speak last year at the National Book Festival, and I'm already inclined to like what she has to say. But this book made me appreciate her so much more. One essay in particular, entitled, "Yes, But Is It True?" really resonated with me, especially in light of having recently read Caught Up in a Story: Fostering a Storyformed Life of Great Books & Imagination with Your Children by Sarah Clarkson. Clarkson's book argues that we ought to use good, true, and beautiful stories to help children grow up to be the heroes and heroines God intends them to be. Similarly, in this essay, Paterson discusses stories as sources of truth. She mentions Tolkien and Lewis, and says that "a novel is a kind of conversion experience" in which we see the darkness in ourselves, as Frodo Baggins does, and "recognize our naked selves with a shudder or a laugh." She then ties this exploration of darkness to her writing of The Bridge to Terabithia after the death of her son's real-life friend. She concludes the essay with the statement that "Fiction is not the Gospel. But it can be a voice crying in the wilderness – and for the writer and the reader who know grace it will not be a cry of despair but a cry of hope – a voice crying in our wilderness: Prepare the way of the Lord.” I think this is maybe the best description I have read of the way an author's faith can inform his or her writing. For me, this essay is enough reason to own this entire book, and it is something I expect I will revisit many times in the coming years. Overall, I really appreciated the variety of pieces in this book and the insight each article gives into Paterson's inspirations as an author. Her book reviews have added several previously unknown titles to my to-read list, and her own essays have made me want to go back and read more of her original works too, especially some of the older historical fiction. I have always liked Katherine Paterson; this book makes me want to explore her work more deeply.